REPRESENTATIVES from community organisations, local politicians and other key stakeholders gathered in Newcastle today (25 October) as part of the launch of First Flight Wind’s proposed programme of community consultation for Northern Ireland’s first offshore wind farm. It will be located off the coast of County Down. 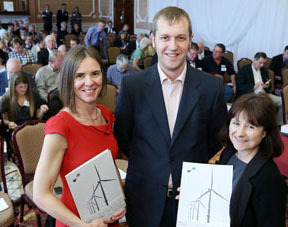 First Flight Wind hs launched its community consultation programme at the Slieve Donard Hotel in Newcastle. Pictured from First Flight Wind are Sacha Workman, Elias Dencker and Dr. Carolyn Heeps. Today’s event allowed the First Flight Wind team to outline and explain its plans to engage with local communities and stakeholders over the next two and a half years in the run up to a consent application being made, potentially in 2015. Speakers from the Department of Enterprise, Trade and Investment and The Crown Estate were able to outline the policy background and the development process for the project. The event also gave attendees the opportunity to view the First Flight Wind exhibition which will now be displayed at six Information Day events in November in Kilkeel, Castlewellan, Carlingford, Downpatrick, Newcastle and Ardglass. Information about the offshore wind project will be publicly available through the project website, social media platforms, the First Flight Wind Newsletter and at the Information Days that will be held at different venues in the local area . Designated Information Points will also give the public access to copies of specific documents relevant to the project. First Flight Wind is a consortium comprising B9 Energy, DONG Energy and RES. It has been selected to develop an offshore wind farm off the south coast of County Down in Northern Ireland, following a tender process by The Crown Estate. Subject to obtaining all necessary consents from DoE and DETI, the project could deliver up to 600MW of generating capacity for Northern Ireland.